I’ve noted it before and I’ll repeat it here: David Bowie, for me, is my personal favorite musician. His albums, almost all of them, hold a special magic to my ears, and I love just about all of them. Released in April 27, 1987, Mr. Bowie’s album Never Let Me Down has to have the most ironic title of any of his albums for there are many, including myself and, reportedly, Mr. Bowie himself, who consider it his worst album. Never Let Me Down? How about: A complete let down, amiright? While I stand by my statement and do feel that, as released, Never Let Me Down is Mr. Bowie’s “worst” album, there is nonetheless plenty on it to like. The problem I had with it back when it was released and the problem I have with it today is that the album feels… wonky. It’s like Mr. Bowie, after the mega-success of 1983’s Let’s Dance and decent reception/sales of 1984’s Tonight, an album some critics felt Mr. Bowie was “coasting” on with too many cover songs, felt he needed to re-establish himself -as he was wont to do- and create something truly great and more personal. Never Let Me Down featured 10 songs and all but one of them were original to the album (the song Bang Bang was a cover of an Iggy Pop song). Compare that to Let’s Dance which had 8 songs and of those, 3 were remakes/covers and especially Tonight, which had 9 songs but of those a whopping 5 songs were covers/remakes. Clearly Mr. Bowie was trying to do something great and more fully “Bowie” at the time but, ironically, the end result felt like he was trying a little too hard. The album was all over the place -overproduced and, IMHO, overcooked. And yet… and yet… it fascinates me. I felt there was a good album hidden in the clutter and buried under the production. Curiously, in subsequent interviews before his passing Mr. Bowie himself noted the same thing and, further, his desire to one day go back to the album and rework/reproduce it. I find the later version an incredible upgrade from the original and, having heard it, any doubts that Never Let Me Down could be a more successful album were gone. 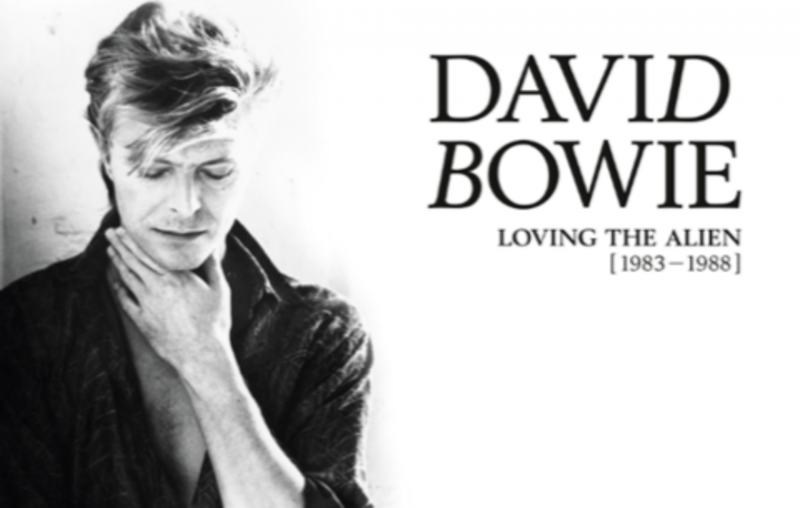 Which brings us back to what I wanted to talk about here: The fourth David Bowie Box Set album, titled Loving the Alien, will feature a -surprise, surprise!- re-working of Never Let Me Down! That’s right, folks, not only will we get remastered versions of Let’s Dance, Tonight, and the original release of Never Let Me Down, along with two live shows and a bunch of b-sides/singles, we’ll also get a complete re-working of that much maligned album. If it winds up sounding like the Time Will Crawl re-working, I’m so there. But a word of caution: The re-working of the album was created, it is stated, in 2018, which is obviously following Mr. Bowie’s passing. Clearly Mr. Bowie wanted to do this but one has to wonder how much -if any!- of the album’s re-working was done and approved of by him before his passing. Still, of the now four boxed sets of Bowie’s work released, this is the one that has me the most curious. Perhaps something many consider very bad might just get another critical look… and prove itself better than it originally was. October, the boxed set’s release date, can’t come soon enough. Interestingly enough, I realized -belatedly and after originally posting- that the Never Let Me Down album, both as originally released and the 2018 version in the upcoming box set, does NOT include the song Too Dizzy, which was on the original album’s release. It’s been said that of the songs on Never Let Me Down, Mr. Bowie really, really hated Too Dizzy and decided, after originally releasing the album, that it would be banished from any future re-issues. So what does the song that Mr. Bowie hated enough to strike from Never Let Me Down album sound like? Yup. I can see why he wouldn’t want it back. Pretty generic pop and certainly not up to the level of other Bowie works. In the last years before the passing of David Bowie, I noticed he had an affinity to “celebrate” his birthdays by giving his fans something special. His birthday is January 8, 1947 and he would pass away two days after his 69th birthday on January 10, 2016. His last two albums, The Next Day and Blackstar, were announced on his 66th birthday (2014) and released on his 69th birthday, respectively. After his passing, the No Plan EP album, featuring his final recordings was released on January 8th, 2017. When January 8th neared this year, I figured something would be released to celebrate what would have been his 71st birthday. I’m ashamed to admit it, but I missed the release, which turned out to be a demo version of one of his biggest hits, the song Let’s Dance. If you’re like me and you missed it, here it is! Clearly a “rough”, pre-Niles Rogers (the producer of the album) version, which he considerably funked up. And yet, everything is pretty much there, lyrically and in terms of how the song “flows”. He previously won Grammys for Best Video?! In 2006 he received a “lifetime” achievement? Yet not one of his albums, many of which are stone cold classics, merited any Grammy love until now? Its worth mentioning, as if the above should clear any doubt, that Mr. Brooks loves film and, while primarily known as a comedy writer/director/actor, he has produced some very serious films yet is forced, because of his name and, as he puts it, the “baggage” attached to it, to hide his involvement in more “serious” works because of fears audiences will think its a comedy or at the least couldn’t possibly be serious. Mr. Bowie, during the first decade of his career, was a trailblazer. He flaunted his sexuality (and possible homosexuality/bisexuality) when just about no one dared do so. But while the images he projected were daring, his music was, IMHO, incredible. Especially for those times, he was a controversial figure and I can’t help but think because he was so “out there” in his looks and stage presence that staid organizations like the Grammys perhaps didn’t dare take note of him. In doing a Google search of David Bowie nominations for Grammys, it was even more shocking to find the following: Mr. Bowie had a total of 19 Grammy nominations, the first three of which came for his 1984 album, and two songs on, Let’s Dance! So, get this: Mr. Bowie’s first nominations to the Grammys happened to be for what was arguably his most audience friendly (some say it was his first “sell out”) album. Think about it. Until Let’s Dance, the Grammys never thought him worthy of nomination for his glam rock years (The Man Who Sold the World, Hunky Dory, Ziggy Stardust, Aladdin Sane, Diamond Dogs), his venture into soul (Young Americans), his incredible -though drug fueled- album Station to Station, his highly rated “Berlin Trilogy” (Low, Heroes, and Lodger), and the early new wave Scary Monsters. While The Man Who Sold The World was all but ignored by audiences and critics alike upon its initial release (though it gained much more love since), all ten of the albums following that one were critically and, for most, commercial hits. There is a wealth of great music in all those albums and, while not denigrating Let’s Dance (I happen to love the album even thought others do believe Mr. Bowie was selling out), it is astonishing that each and every one of those albums didn’t merit any Grammy love. I suppose its better late than never and I suppose it helps to die just days after releasing your last (and, again, critically lauded) album. Yesterday, January 8th, would have been the 70th Birthday of David Bowie. Last year tomorrow, on January 10th, Mr. Bowie passed away. Last year Mr. Bowie released his final new album, Blackstar, on his 69th Birthday. For his 70th Birthday, No Plan, a four song EP, was released to mark his passing and give fans the last music the artist worked on before he passed. Though the songs aren’t really “new” -they can all be found on the Lazarus soundtrack and the actual song Lazarus, the fourth on the EP, was part of the Blackstar album- this is the first time you can buy them on their own and outside of that Broadway soundtrack. Since I truly didn’t care to buy the entire Lazarus soundtrack -sorry but I like to hear David Bowie singing David Bowie- I didn’t bother getting the Lazarus soundtrack but jumped at the chance to buy the EP (for those wondering why I didn’t just buy the other songs on their own, the three “new” songs could not be purchased separate from the full soundtrack). Anyway, the EP was released, I believe, on Friday though the Amazon listing states its release is for tomorrow, January 10 (I guess they wanted to keep with the David Bowie birthday theme). I picked up the EP yesterday and, if you like Blackstar, you’ll like the three new tracks presented. It’s hard to point out which of the three is the best (and if I were to consider all four, I’d probably tilt toward the already released Lazarus, a song that feels like an eerie coda to David Bowie’s life and then upcoming passing). I suspect in the near future we’ll see more “unreleased” David Bowie material appear. There is apparently quite a bit of it -excluding, of course, the vast amount of live shows that were surely recorded. As can be seen in the graphic, this song was created for what eventually became the Diamond Dogs album. Originally, Mr. Bowie intended to create a musical version of George Orwell’s 1984 but the late author’s wife refused to give him permission to make the album and therefore he was forced to make some changes (no pun intended) and, viola, Diamond Dogs. There’s a Big Brother song as well and the Sweet Thing/Candidate medley (very good stuff but I have to say, I prefer the unreleased version of Candidate to it!). Anyway, those who are fans of David Bowie, the bottom line is this: There’s a “new” EP out there and you get one more taste of what David Bowie was up to just before his untimely passing. Perhaps other buried treasures will be found among his previous recordings and “new” and interesting Bowie songs will also appear in the near future. By God, listen to how smooth his voice was here! Really sad to think there’s nothing “new” coming out from this extraordinary man anymore. I’m so thankful, cause we’re strangers when we meet. I’m in clover, for we’re strangers when we meet. Heel head over, cause we’re strangers when we meet.